Sweet Marjoram is a wonderful aromatic herb ideal for adding flavour to soups, stews and pasta sauces. 8-10 weeks to harvest. Perennial. Each packet contains approximately 900 seeds. 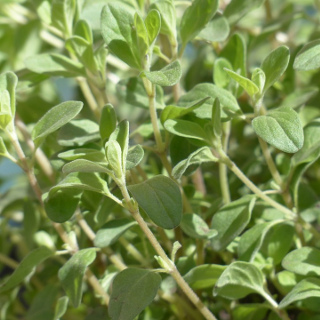 Sweet marjoram is native to the Mediterranean island of Cyprus and parts of Southern Turkey. Sweet marjoram has a flavour similar to oregano to which it's related, although sweet marjoram is milder with additional hints of citrus and pine. The dried leaves of sweet marjoram are used in several herb mixes including the French herbes de Provence and Middle Eastern za'atar. The leaves can be used to season meats, soups, stews and sauces. If left to flower sweet marjoram will attract insect pollinators such as bees to the garden. Sweet marjoram will grow well in full sun or light shade. Sweet marjoram grows best in a free-draining, sandy-loam soil rich in organic matter, if your garden is lacking place down a layer of compost or well-rotted manure prior to planting. Sweet marjoram isn't frost tolerant, mulching around plants before Winter can help to protect their roots from freezing but if you live in an area that gets too cold it may be best to grow sweet marjoram as an annual instead of a perennial. Alternatively you can grow sweet marjoram in pots and bring them inside during Winter. Avoid over-watering sweet marjoram plants to prevent root rot and fungal diseases. Sweet marjoram is drought tolerant once established. In cold and mountainous regions of Australia sow sweet marjoram seeds in late Spring or early Summer. In temperate regions of Australia sow sweet marjoram seeds from mid Spring to early Summer. In subtropical regions of Australia sow sweet marjoram seeds during Spring. In the tropics sow sweet marjoram seeds during the dry season from mid Autumn to early Winter. Sweet marjoram seeds are tiny, so surface sow them and cover with only a very fine sprinkling of growing mix. Sweet marjoram seeds require light to reach them in order to germinate so don't bury them too deeply. Press down gently to ensure good contact between the seeds and the moist growing media, doing this will help prevent the seeds from drying out between waterings. If starting in seedling trays prick out seedlings into individual cells as soon as they big enough to handle. Plant sweet marjoram starts or thin seedlings to about 20cm apart to allow room for growth. Sweet marjoram seeds germinate quickly with seedlings taking between 7 and 14 days to emerge once sown. You can start harvesting sweet marjoram leaves 8 to 10 weeks after sowing. Regular harvesting of stem tips will encourage bushier growth.